The 5D Mark II continues to impress me. This 9-minute exposure would have been insanely noisy on my old 30D body. Granted, this was taken at ISO 100. But still, this bodes well for when I try to do a real star trail photo some time down the road. I'd like to see how the noise holds up at 30 minutes or an hour. Also, the full frame sensor allows me to get a wider view of the star field (something that used to frustrate me with the 1.6 crop of the 30D). Actually, this was just a test photo and completely an accident. 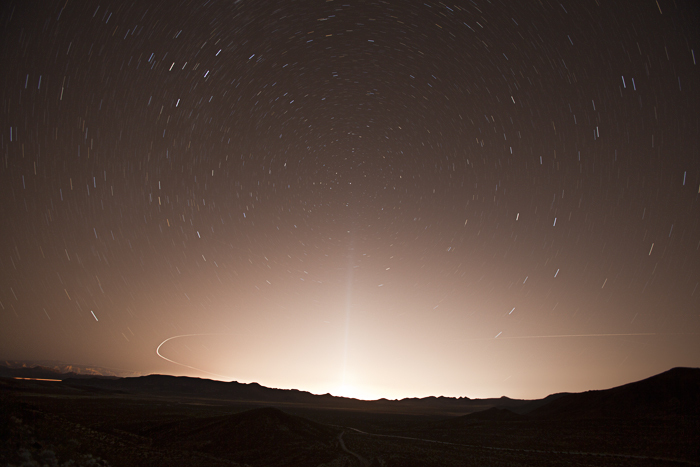 We hiked to the top of a hill and I basically pointed the lens toward the glow of Las Vegas. Little did I know that the Luxor beam was almost directly beneath Polaris. Very serendipitous. (Yes, I realize that the beam isn't vertical—in other words, the horizon really isn't level—but I like this composition better).